My day where 'forgive and forget' weren't available and what I did instead. On Sunday, I found myself in a position where I was neither able to forgive nor forget. Nothing major had happened. My brain had just fixated itself on a couple of things which had been said, done, not said and not done by a tiny minority of people in my life. I couldn’t just forgive and forget. My raw emotions were anger and frustration at the unfairness of the way I felt I was being treated (note: the ‘treatment’ was purely based on my interpretation and how I was viewing the story in my head) and the logical ramification (again created purely in my head) that I was, therefore, undervalued by these people. The reality of the circumstances would lead some people to advise me to ‘forgive and forget’ because the individuals involved weren’t fully responsible for what they were doing/not doing and because the resulting consequences of the way that I felt were entirely unintended. But for that one day, ‘forgive and forget’ weren’t accessible to me. Why should I not expect my friends to value and reciprocate my friendship? It felt very odd and very hard to accept that as ‘ok’ or ‘good enough’. So I had a big cry. And I tried to take it out on the tennis court. But that backfired because my radar wasn’t very accurate that day so I played terribly. And then, late in the evening, I had a massive breakthrough and a really valuable insight. Forgive and forget aren’t the only options. Someone has done something wrong. You know that. They may or may not know that. You find a way to justify forgiving them and either leave that relationship behind or allow it to move forward without being tainted by that indiscretion. Gain or choose the perspective that the matter was insignificant and therefore you can just leave it in the past. It has no relevance or importance to the present or future of the relationship. Sometimes forgetting just isn’t going to be possible. It’s not insignificant or unimportant or irrelevant enough. And sometimes forgiving is only going to be genuinely and fully possible if the other person knows and acknowledges their wrong or the fact that it’s had an unintended consequence that’s had an impact on the way you feel. If you have to or want to have an ongoing relationship with that person, is it better to speak up? The real skill and challenge is in finding ways to share how you feel and allow the other person to hear that what they may or may not have done has caused you upset without, in turn, causing them to react defensively or, more importantly, causing them unnecessary hurt. What are the right words to use in that scenario? I don’t have the answer to that right now. Or perhaps there are occasions where precisely what you need to do is cause them to react in some way or for them to feel some hurt? On Sunday, it wasn’t the right time to speak up. That time may come in the future. But I realised that it was the right time to feel angry and frustrated. To give myself permission to sit up to my armpits in those nasty, icky feelings. To realise that I have plenty of people in my life who do value me and are willing to back that up with the way that they behave and communicate. If someone isn’t able to do that right now, or at all, it doesn’t have to mean that our relationship is dead but it might mean that I choose to give them less of my precious energy, temporarily or permanently. And the really big insight was when I realised that I’d rather be disappointed and sad for one day in relation to a couple of people than depressed about everything. 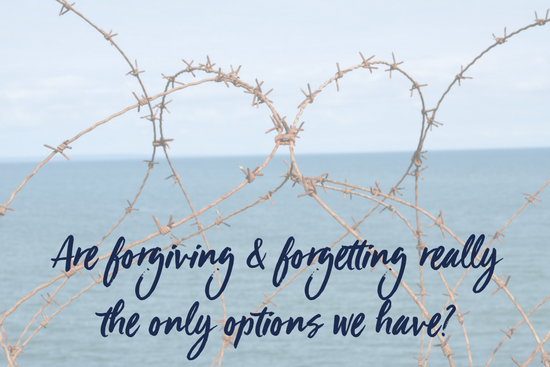 If we can honestly forgive and/or forget then they’re great options that are available for us to choose anytime. But if they aren’t accessible right now then perhaps there are other ways of coping and, most importantly, processing the ways we are made (not true, the ways we choose) to feel as a result of the actions/inactions of others. If you like this kinda stuff and want more of it in your life then, boy, do I have an amazing opportunity for you right now. My group coaching programme, Spring Clean Your Thinking, is open for enrolment for 50 wonderful women to begin next Thurs, 1st March 2018. It’s a super supportive group in which you’ll complete and discuss activities with the goal of boosting your levels of both contentment and confidence. Find out more and snap up your place by clicking right here, right now.